A feast of goals were on the menu in Division 2 this week with 48 of them banged, whipped, sliced and in some cases scrambled in to the onion bag. San Pells served up a starter for what was to come as they roasted Sui Wei 7-0. Gary Pratt certainly did not live up to his name as he bagged 5 for the victors with the other goals coming from Peter Harrod and Charlie Clack. Shui Wei were made to pay the price for having a small squad in the hot conditions and their opponents were in an unforgiving mood as they continue to churn out impressive results. Revo’s resurgence continued as they made it back to back 3-0 wins by seeing off the challenge of Wanchai Wolves. On the tight Happy Valley pitch, both teams pressed hard creating a tense, high tempo contest. Revo were given the chance to take the lead with a penalty mid-way through the first half but saw the effort come back out off the underside of the bar. 10 minutes later though, Chris Marshall opened the scoring as he caused confusion at the back before latching on to an error and lobbing the advancing keeper. 2nd half Wolves continued the furious tempo as they looked to get back in to the game but Revo held firm in defence. With 5 minutes to go, Wolves rolled the dice and threw on an extra attacker leaving space at the other end for Revo to exploit. Chris Marshall doubled his tally looping a header over the keeper from the edge of the box as time stood still before Andy McLeod made it 3, slotting home a last minute penalty with typical swagger. A game certain to go off with a bang was Shooters vs Young Guns and so it proved in a 5 goal thriller. Satoshi Uehara and Toshiyuku Nishii gave the Japanese side a 2-0 lead before Young Guns hit back with 2 free-kicks buried by Justin Wong. Shooters however were not to be denied and with 2 minutes left on the clock, they won the contest through Shintaro Koba, picking up their first points of the season in the process. In a huge 6-pointer at the foot of the table, BOC’s took on MBFC with each of them looking to break their duck for 2018/19. In what was a game for the purists, both sides were able to celebrate a rare clean sheet as the game ended in a 0-0 stalemate. MBFC were left calling for the introduction of VAR in to Legal League Division 2 after some questionable offside calls….dig deep in to those pockets Henry! 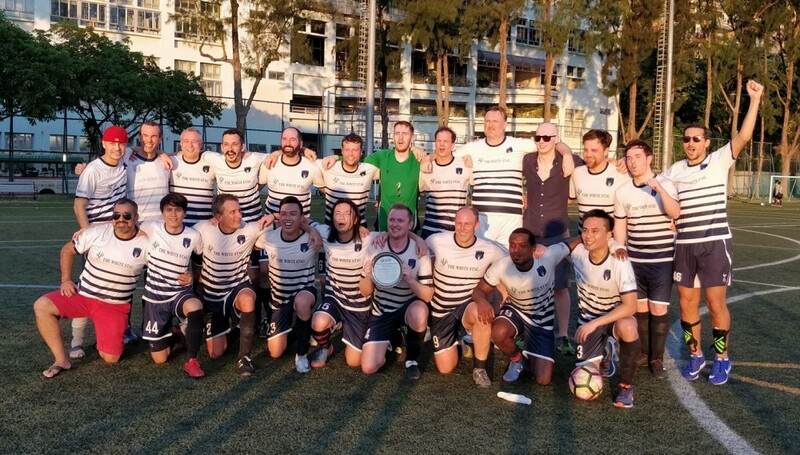 In stark contrast, Dragon Valley and Legal Head produced 8 goals, a couple of worldies, controversies, unsavory scenes and a hell of a match report between them as two of the league’s most entertaining sides so far this season served up a cracker. DV took the lead through a lobbed finish by Paul Martin but LH were quick to come back and edge ahead 2-1 at the break after strikes from Henrik Pederson and Gurung Misal – one of which was a 25 yarder lashed in to the top corner. 2nd half was a different story as Jaffray Lai, Max Remington and Holex bagged in quick succession, putting DV 4-2 up in no time after the restart. With Legal left scratching their collective Head appealing for offside, Michael Verguizas ran through and dinked the keeper to make it 5. The scoring and drama did not end there as Jamie Kelly smashed home a free-kick to make it 5-3 before some tempers frayed between the teams at the final whistle as a topsy-turvy encounter threatened to boil over. Saturday’s final game kept the goals flowing as Vikings put Samurai Blue to the sword with a 6-3 slaying. Manager Kais was left bemoaning his sides lack of luck as a close game was ultimately decided when SB keeper picked up an injury and had to go off, making life easier for Vikings attackers to take their chances. Younes Aboubker, Conor Killeen and Ahmed Jamli getting themselves on the score-sheet for Samurai Blue. Still waiting on Vikings scorers. Monday night saw Mes continue their march as they smashed Royals 7-2. In what was an even contest first half (with the KCC side leading 2-1), it was all change in the 2nd period with the superior fitness and quality of Mes kicking in and taking the game away. Mes goals from Ben Rose (2), Chris Delaglesia, Massie Kallon, Oumer keita, Rob Barrett and Yianni Kyriacos with Luca Merlone bagging a brace for Royals. KCC Cavs maintained their 100% record but were made to work for it in a close game with Old Speckled Men. Whilst the Cavs lads may need to toughen up physically, there is nothing wrong with their mental strength as they came back from 2-0 and 3-2 down to finally win the game 4-3. More praise was given to Cavs for their flowing football which has been a feature of their season so far but OSM will be disappointed not to have taken something from a game where they hit the bar 3 times. Stefan Antonic, Jason So, Bennis Wong and Ryan Jarvis ensured that Cavs stay top with Harrington and Leung (2) scoring in vain for an improving OSM side..Waiting on Division One report.